Amazing Luxury 1 Bedroom Apt. Situated amongst the high-rises, just one block from the famous "Avenida del Libertador" in the most elegant part of Palermo, you will find our luxurious one-bedroom apartment on the 11th floor. Enjoy breathtaking views by day of the River Plate and by night the stunning bright city lights. As for location, you are in the heart of Palermo and can"t be better situated. Step out of the building and walk to the incredible zoo, Botanical Gardens, Evita Museum, Rosedal (infinite number of rose bush varietals and a lake to run around,) Hipodromo (horse races,) Campo Argentino de Polo (polo fields,) and Club de los Amigos (tennis, swimming, and other sports.) 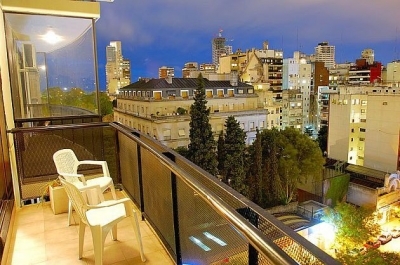 You"re also within blocks of Buenos Aires best museums: the MALBA and the Museo Nacional de Bellas Artes, Recoleta, Palermo Soho as well as dozens of Argentina"s finest restaurants, boutiques, and gyms. Please note that we also rent the 2+ bedrooms penthouse in the same building. Our lovely apartment is fully equipped with the highest quality queen-sized bed, modern furniture, beautiful wood floors, and original paintings from local artist, Josefina Fulua. There are air-conditioners in the bedroom and living room and the kitchen and bathroom use a combination of tile, marble and granite. We cook with a gas stove and heat the apartment with radiators. The apartment also is quite spacious and has a leather couch that folds out to a second bed. There is a flat-screen television with cable, a cd/dvd player/stereo with surround sound, a complimentary high-speed WiFi internet connection, cell phone and a local phone.